Need Express Delivery? (Click Here). 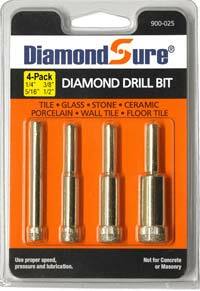 DiamondSure brand Diamond Drill Bits are known as Diamond Hole Saws and also as Diamond Core Drill Bits. 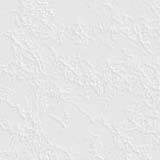 They are used to drill glass, ceramics, ceramic tile, porcelain, porcelain tile, slate, limestone, marble, granite, other light stone, and fiberglass. For all drilling - Just use proper drill speed, low pressure and use plain water for lubrication. 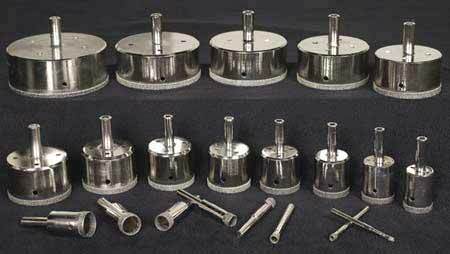 Diamond Core Drill Bits and Diamond Hole Saws have a hollow center and cut a circle in the material to create a hole. This results in a hole the size of the drill and a smaller "plug" or "core" which comes from the center. The advantage of a hole saw style drill bit is that is only drills out a small portion of the hole - about 10% compared to a solid drill bit. When drilling in soft materials, a hollow drill bit becomes most effective at about 1", however, in very hard materials such as glass, tile, porcelain tile or stone, they are preferable to solid bits for even small sizes. Technically, core drill bits and hole saws are exactly the same - except for the "size" designation" of the drill bit. Core drills are measured by the inside diameter, which is the "core size" of the "plug" that they produce. Hole saws are measured by the outside diameter of the bit, which is the "hole size" that they produce. With the exception of the size designation, diamond core drill bits and diamond holes saws are exactly the same. Diamond drill bits are available below in sizes from 5/64" to 5-1/2" (outside diameter). The metric manufactured size of each bit is also shown below in milimeters, along with the exact inch measurement. apply about 12 to 16 lbs of pressure to the drill head. Diamond file is 7" long with a "half-circle" tapered profile. The profile very works well as a universal file since it can be used on flat, rounded or curved edges. The file blade of the file is 3/8" wide, tapering to a point, so the file works well on small or large holes or projects. The diamond file is perfect for filing sharp edges off glass, reshaping cuts or reaming drilled holes in glass, tile or porcelain. The file handle is vinyl coated for safety and comfort and is red in color so it is easy to find when you set it down.